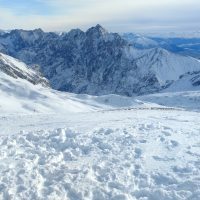 It’s a shame it has taken me so long to get this post out – but I suppose that it may be for the better, so you can plan ahead for the next winter! 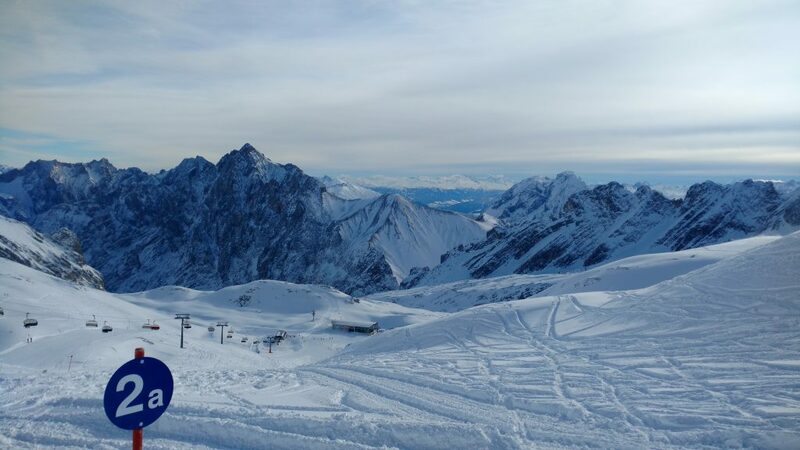 Taking the time to go skiing at Zugspitze, the tallest mountain in Germany, is definitely well worth it. Taken from the top of the main chairlift at the park. 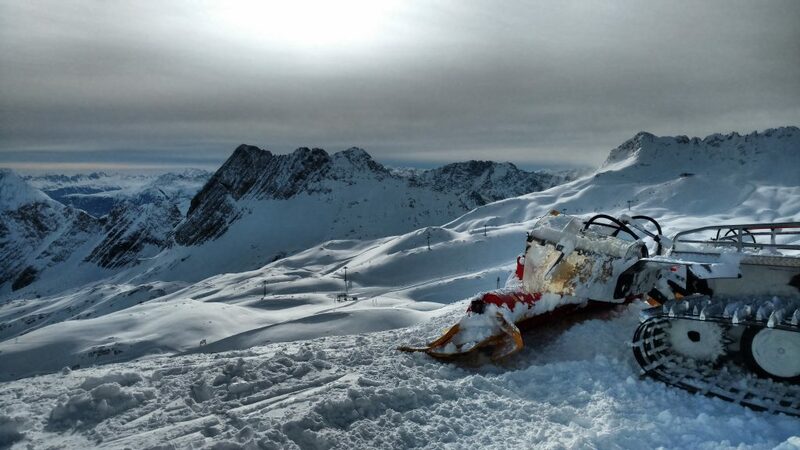 So much fresh pow to shred. 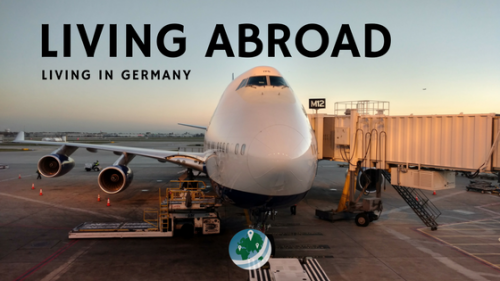 It’s a simple day trip from Munich, with train or car. 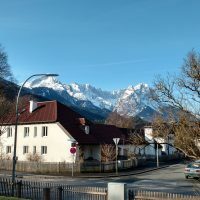 The drive is short from Munich – about an hour or so – and the train takes about an hour and a half to the base of the mountain at Eibsee. 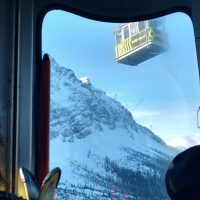 From there, whether you drive or go by train, you can take either the mountain train to the ski area or the quick cable car to the summit. The nice thing about taking the train (there and back) is that for one ticket, you get everything. 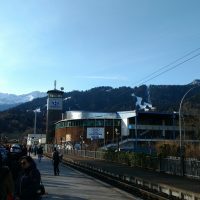 In addition to the train tickets, it includes the ticket for the cable car or the mountain train, and the lift pass. The train cars are big, comfortable, and have plenty of space for you to sit, and for you to stow your equipment. They are dedicated to this specific route through the mountains, so the tables have a nice little map printed on them. 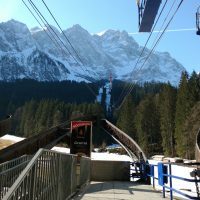 the cable car, or “Seilbahn”, that runs between the Eibsee Zugspitzbahn station/parking area, and the summit contains the longest distance between two support towers of any cable car system in the world! … Luckily, I trust German Engineering. 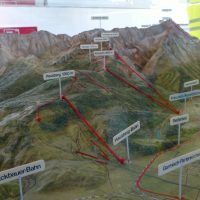 This is little model they have in the cable car station, showing all the various important lifts and trains in the area. 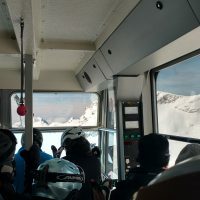 It can be a little claustrophobic in the cable car itself, but the trip is much quicker than the mountain train, and you get some pretty lofty views, if you’re by the windows. 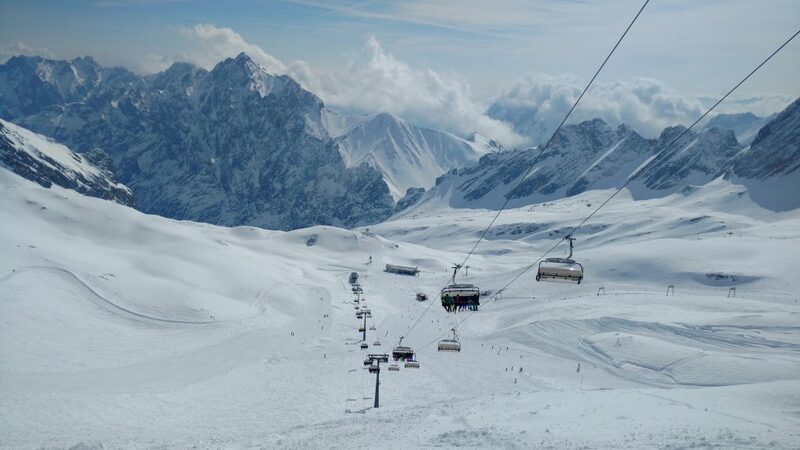 The first cable car, the Eibsee Seilbahn, actually takes you to the summit of the Zugspitze, not the ski area. 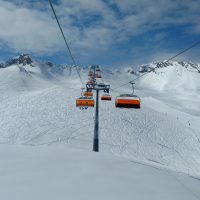 So a second cable car takes everyone down to the ski area directly. 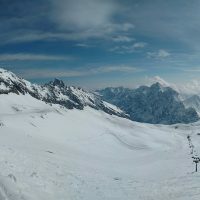 Time to go skiing at Zugspitze! Now on to the actual skiing itself. 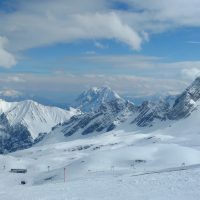 Skiing at Zugspitze, while not the highest or biggest or best ski area in the world, is certainly a great time. 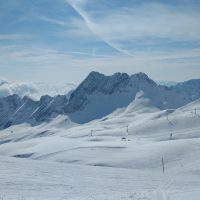 Due to its altitude and immediate geography, the ski area enjoys plenty of snow from early winter and into spring. 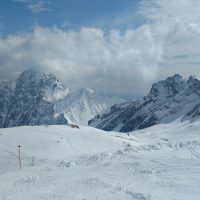 The Zugspitze ski area, Zugspitzplatt, as opposed to the Garmisch-Patrenkirchen ski area right at the base of the mountain, is bare and essentially free of vegetation. 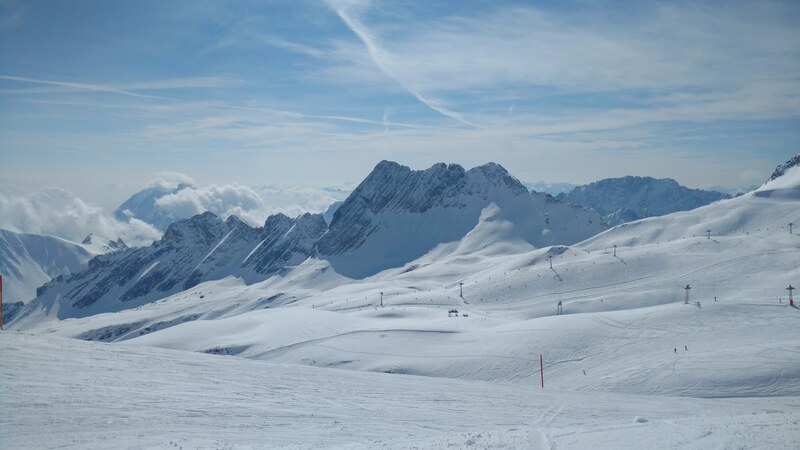 The bare surface of the Zugspitzplatt really gives you an appreciation for the enormous size of the area and ski areas in general. 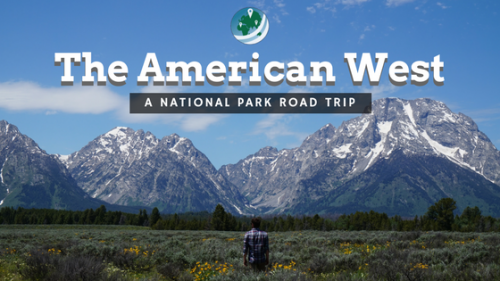 The Platt was covered by a glacier as recently as the 1800’s so most of the ground is broken rock fragments and bedrock, as all the soil was stripped away by the glaciation and weathering. This was pretty new to me, and I liked the tree runs at Steamboat Springs in Colorado, so I was a bit worried that I wouldn’t enjoy it as much. Much to the contrary, I found the complete openness of area to be an awesome feature of the Zugspitzplatt. It really gave you a perspective of the different ski runs and an appreciation for how fast you really descend a mountain on skis. The difficulty of the runs is not that varied, however. 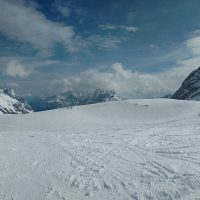 For an intermediate skier like me, the Zugspitzplatt provides a great variety of runs to ski. 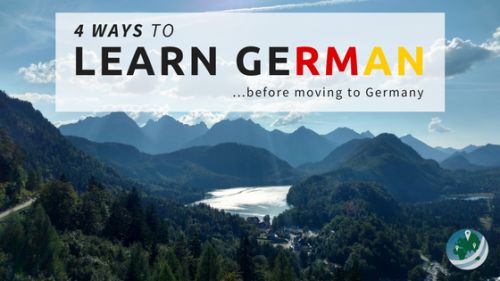 By the German scale, there are only blue and red runs (beginner and intermediate) however, if you compare this to the American scale I have experienced, it’s harder. 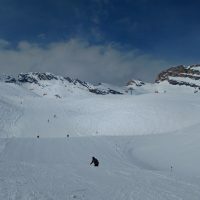 I would say that the beginner runs here were similar to the intermediate runs at Steamboat Springs, and the intermediate runs at Zugspitze were similar to the advanced-intermediate or the even advanced runs at Steamboat. 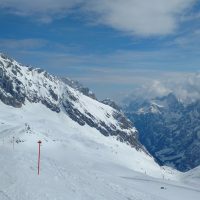 While skiing at Zugspitze, you’ll see that the runs are denoted by numbers with a sign color corresponding to their difficulty. 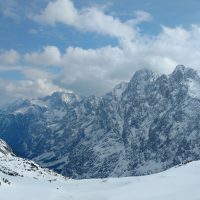 I went skiing at Zugspitze three times this past season: once in January, and twice in early spring (late March, early April). 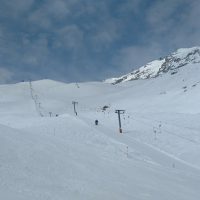 The snow was by far the best in January, with fresh pow to shred aplenty. The snow in spring wasn’t so reliable. 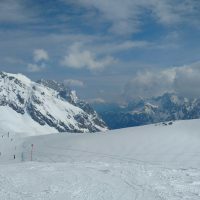 For the first visit, it was pretty good and smooth, but for the morning of the second visit, the slopes were ice. 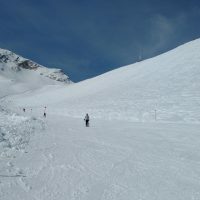 During the afternoon, the snow became softer and easier to ski on. 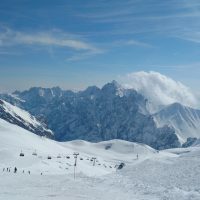 Overall, the ability to go skiing at Zugspitze is a great asset to the Munich area: it is very easy to get to, and relative to skiing in the US, it’s cheap. 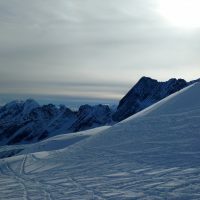 The snow is usually good, and it offers a nice array of runs to enjoy on a day trip from the city. Highly recommended! 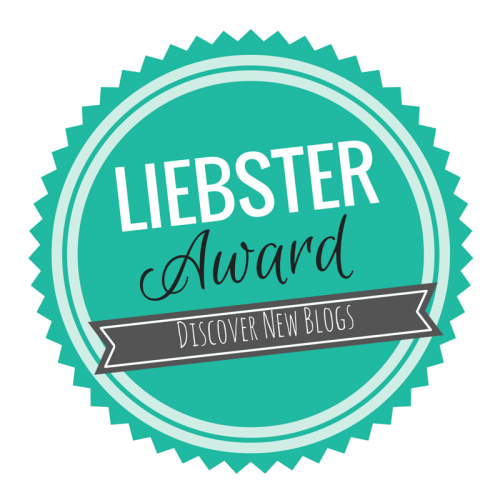 If you need more inspiration, as always, check out the gallery below. First run: It’s gonna be a good day. 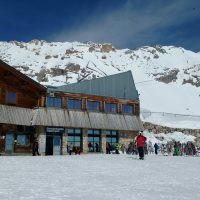 A panoramic of the ski area, and the Sonnenkar lift. What a beautiful view. The lifts are quick and easy to board, if you’re used to it. 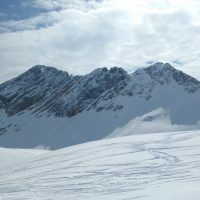 One of the ridges making the bowl that is the Zugspitzplatt. That ridge from the previous photo is on the right! The whole area is just unbelievable. The Brunntal run wasn’t open in January yet, but had opened up for my later visits. A bit more difficult, but much longer runs. This is a T-Lift, they’re made to carry two at a time, but most go alone. 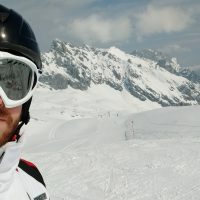 It makes it a bit hard to balance the force the system pulls you with, because you’re dragging on it from only one side of the T. By far the hardest part of my time skiing at Zugspitze. The barren and tree-free ski area really gives you a new perspective on the size of the mountain. Shred it. 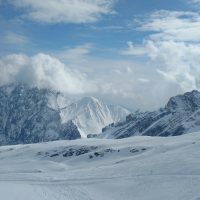 Skiing at Zugspitze requires you to go at least a little bit off the runs. With the sun beginning to be obscured by the afternoon clouds, it was almost time to start the journey back home. Seriously, don’t fall off. You can’t really get back up… Stunning valley view.